Snow Day!!! I caught up a little with February's block is Nine Men's Morris game board. This is the second block for this QA. Nine Men's Morris...I'll have to Google this one. I've never played it. I'm linking back to Alida's blog, alidatweloqdesigns. The linky party is here. 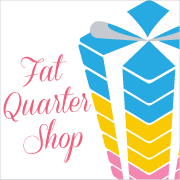 Last month I won a $25 gift card from the Fat Quarter Shop for linking up! Thank you, Fat Quarter Shop!!! I need a little motivation to get walking again. I found this cool site called Walking 4 Fun. I have linked it to my Fitbit. I have decided to walk the Appalachian Trail. Each day I walk a little more I get to see pictures of where I would have walked on the trail (taken by somebody else, of course.) I can't wait to see where this takes me. Today I can see myself waiting behind this guy to take my picture to measure my backpack (I have "saddle bags" on my thighs instead). Here's my map. I'm starting in Maine! Can't wait to see what happens!!! This week I played with scraps and planned to make nine snail trail blocks for the Block Lotto. Well, there was this little incident where I was not able to sleep combined with some sewing, and a good movie (Jurassic World) and I managed to make four qualifying blocks and four CRAFT FAIL blocks. Linking up with Angela at SoScrappy for the RSC16. Check out all the scrappy deliciousness! 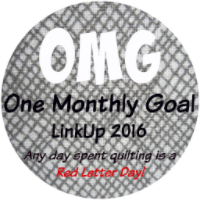 I'm linking up with Red Letter Quilts with a project that I plan to finish this month... or so I hope. This little quilt has been on my longarm for too long. It's a winter scene. It has been too cold to work on my longarm because it is in a building that we do not heat 100% of the time. Today it's 50+ degrees -- for February!!! I'm hoping to have my first finish of the year this month. Happy February! The groundhog saw its shadow, so that means six more weeks of winter here in Ohio. Really? It hasn't been that bad. I'll take it! So far it's been a mild winter for us. Last year we were covered in ice. Like I said, I'll take it. Well, my part-time job has turned in to 32 hours or so a week. But that's a good thing. I don't have to sign up for that many days. But I really LIKE it! So I'll keep signing up as long as the schedule matches my son's school schedule. Whohoo! Little has happened in the quilting world. Check back later this week for hopefully more updates. I plan on sewing this rainy, February 3rd, ALL DAY except for a brief run of errands. YEAH for me! I made a Sister Sampler Block. Most likely this block will end up on the back of my Celtic Solstice. I'm getting to the point where I should be having plenty of orphan blocks in pink/brown/grey/ cream/ maroon to having the back complete. This is a fun BOM going on at Gen X Quilters -- Quilt Inspiration with AnneMarie. I'm linking up to her linky party for the January block here. I managed to finish the blue blocks needed for the borders for Folk Art Birds from Kathy Doughty's book, Making Quilts. Here's some of the blue plus blocks I made with misc. neutrals for the backgrounds. It will be my 2016 scrap project for It All ADDS UP! #APQQuiltalong.